For the third consecutive year, Becker's Hospital Review has named Mid Coast Hospital one of America’s 100 Great Community Hospitals (2018). Released on July 23, the 100 Great Community Hospitals list recognizes hospitals for their clinical quality, operational excellence, and economic impact on the surrounding area. Only two Maine hospitals made the list. "Being recognized as one of America's top community hospitals for three years running is a true honor," said Lois Skillings, President and CEO of Mid Coast–Parkview Health. "Every day, the physicians, nurses, staff and volunteers at Mid Coast Hospital go above and beyond to ensure that our patients come first and that the quality of care we provide is exceptional. This recognition confirms that we are meeting our extremely high standards and delivering on our promise to provide outstanding healthcare in this region." 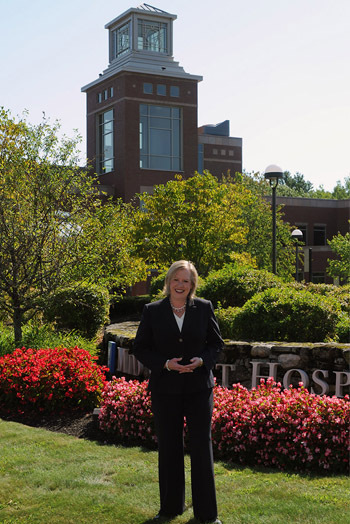 The Becker's editorial team selected hospitals for inclusion based on rankings and awards from organizations such as the National Rural Health Association, iVantage Health Analytics, Truven Health Analytics, Healthgrades, CareChex, the American Nurses Credentialing Center, and the Leapfrog Group. Mid Coast remains the only community hospital in Maine to be named a Magnet™ hospital for excellence in nursing and patient care by the American Nurses Credentialing Center. Earlier this year, Mid Coast Hospital received an "A" Hospital Safety Score from The Leapfrog Group and was named one of only 49 hospitals in the nation to have achieved straight A's since the safety grades began in 2012. "As a local not-for-profit, coordinated healthcare system, we remain committed to ensuring access to the highest-quality and affordable care in our community. In fact, our costs are 30% lower than the statewide average," said Skillings. "With this recognition, we are grateful to be acknowledged among our national peers for the care that we deliver locally."